I’m sure we all have a bunch of leftovers from yesterdays dinner marathon and no doubt the blogs will be hot today with fantastic recipes on what to do with those leftovers. You can take this post as a bit of tongue in cheek humor against the day after, but feel free to actually make these turkey dinner shots. I think my target audience will be my kids who seem to like anything miniaturised or strange looking especially if they can actually eat it! I was inspired to post this recipe, if you want to call it that after reading a blog post last night. It was written by a Los Angeles food blogger, Andrew Wilder. He writes for his healthful eating blog, Eating Rules and has also started writing for Blog Tutor. 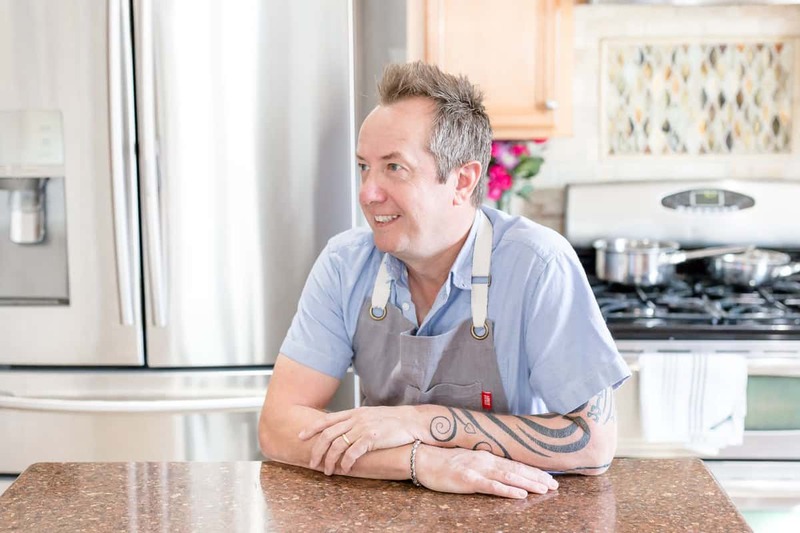 Andrew’s first Blog Tutor post was a great story about how the foodie blog world seems to be getting over saturated with recipes and how this can affect the direction of your own personal blog. When I first started Foodness Gracious I must admit to being hung up on the number of followers I had and being disappointed if I only received a few comments to a post which maybe took me a lot of time to generate, I didn’t understand that building a blog takes time and lots of dedication. Now I’m not so driven by those two elements, I still get excited to welcome a new follower on board but now I see it as an opportunity to gain another friend who shares the same passion towards food as I do. I can honestly say that I enjoy communicating through my blog with some great people from all over the world and hope to meet some of them someday. I try to switch up my posts as much as I can but I think to survive in the food blogging market a true uniqueness has to be shown and I’m constantly thinking about how I can do that. I don’t want to keep taking Andrew’s points from Blog Tutor, just make sure to pay it a visit and read the whole post for yourself. It certainly made me think and hence the turkey dinner shot was discovered. Is it the first one? Maybe I’ll Google it and see what comes up. 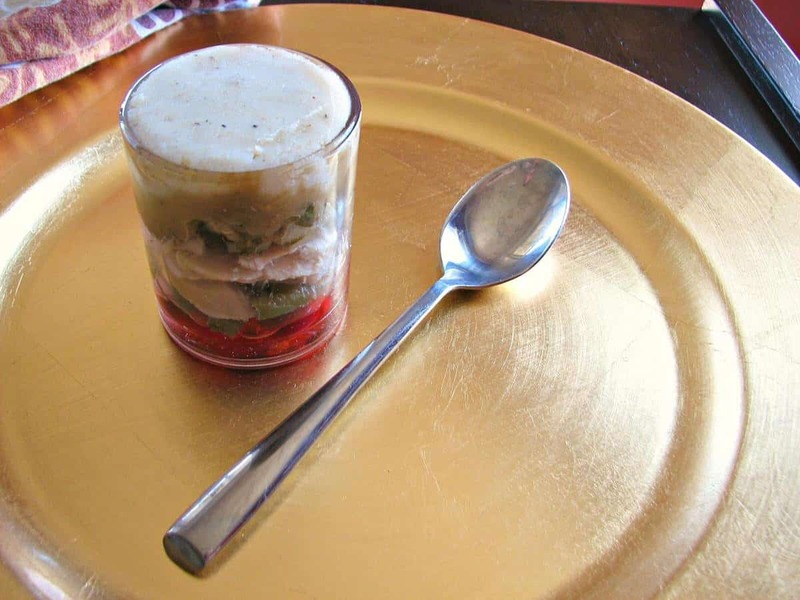 Take some leftovers and layer them in a shot glass. The process is completely up to you, think about how you would eat the food from a regular plate. Are you a person who likes to try everything separately or like me who puts a little bit of everything on the fork at the same time? Hahaha that is absolutely hilarious. Are those mashed potatoes on top? Happy Thanksgiving! And here is another new follower, courtesy of Rebecca at Chow and Chatter who tweeted your post! I couldn’t agree more about the friends you make blogging. Allison, yes the layers are, mashed potato, gravy, stuffing, turkey, green beans and cranberry sauce! I love this! Would go over well for me but not Grumpy by any means….He would have to fill his plate up. I’m all for small portions though so this is very appealing – and its the first time I have seen it! That’s a creative way to server turkey leftover! These are ACE! Kids aren’t the only ones who love little mini food…me too! Headed over to check out Andrew’s post now! I’m digging your leftover shot — love this creative take on it. I too have found that the best part of blogging is the friendships you forge with fellow foodies! Thanks so much for linking up to Friday Potluck this week. :) Glad to be one of your bloggy buddies. It looks pretty layered in the shot glass. When I first started blogging, I obsessed over my numbers a bit, but after reminding myself about why I blog(to document my life in the event that I might someday go senile,) it’s easier to just blog for the joy of blogging. How funny. As my nephews were here, one of them wondered out of the kitchen with a shot glass full of water. My, did we all do a double-take! I have no idea where he found it for it was an OLD remnant of college days. This idea would have put it to much better use. I love this idea. I also love what you wrote about being a blogger and having followers and comments. It’s hard sometimes when there are no comments and it usually has nothing to do with how well the post was written, etc. Wise words – the friendships are the best reason to blog! Oh how funny! I have seen lots of unique recipes on blogs, but none quite like this! Oh wow I love the idea of stacking everything together. I tend to put lots of different things on my fork..you get all the flavours together. Ps. I’m your latest follower. I love your recent posts! Gerry….I’ve missed coming here too! I totally get what you’re saying here about the side-addiction of blogging, ie. worrying too much about the numbers and comments. I must’ve gone through that phase too at some point, but realize I’m happier now that I’ve started not to care too much about the ‘ratings’! Lol. I just try to post up quality stuff, otherwise I do nothing at all. My friends always do come round and comment, bless them… you included! As for this leftover shot glass idea, I absolutely love it both for savory and sweet presentations. I’m just a big kid at heart :).